July 2016 marks my decade of being a proud Capitol Corridor rider. I first rode the Capitol Corridor on Sunday, 02 July 2006, following my stay at, and orientation for U.C. Davis. While being from Los Angeles (Pasadena), there are many rail services, but the Capitol Corridor just seemed different, in many good ways. The first thing that amazed me was the commuter rail-like schedule. Capitol Corridor is an intercity rail service, just like the San Joaquin and Pacific Surfliner routes; one expects less than twenty trips total for service per day. However, Capitol Corridor–again, despite officially being intercity service–has a commuter rail schedule, like that of Caltrain (S.F. Bay) or Metrolink (Southern California). This service frequency just amazed me, as the Pacific Surfliner in Southern California was quite the opposite in schedule. 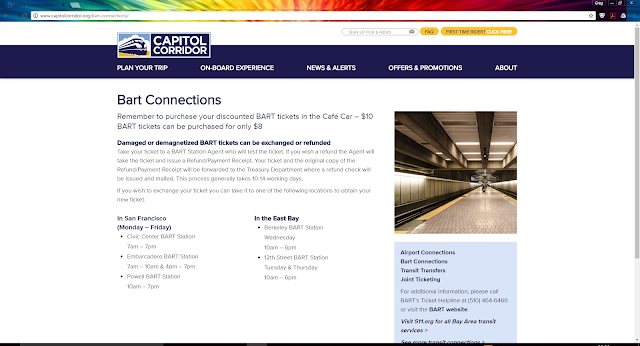 Additionally, Capitol Corridor even offers a discounted BART ticket–a $10 value for only $8. The Surfliner and Metrolink did not offer deals like this for connections–including the Metrolink routes not sharing track. And besides, most people know to take Metrolink in the corridor, as it is almost half the costs of what the Surfliner is, and has better schedules. However, there is a major downfall to the BART-Capitol Corridor connection, and that is when a Capitol Corridor train leaves away from the Richmond BART station, as it did to me tonight, when you are racing to connect through the underground passage. Tonight is not the first time this has happened; I will mention the others momentarily. I was in Millbrae for the day to checkout housing for grad school. When I noticed I could grab the Capitol Corridor 742 at Richmond with the next BART, I cut my dinner short, packed everything up at my booth, and ran like the wind to the Millbrae BART - despite my recent lower-back issues. Fortunately, I caught the needed BART, and even made my transfer at 19th Street Station, as scheduled. I was supposed to arrive Richmond BART at 18:36, and the Capitol Corridor would arrive at this station, as well, at 18:42. Because of another BART train being on the track ahead of my train, we were delayed. However, as we pulled into the station and the doors opened, the Capitol Corridor 742 pulled in, as well. Again, despite the lower-back issues, I decided to book-it. As I was making my way upward to Capitol Corridor, I heard the train’s whistle, and saw it departing. As I reflected about this–with several expletives, I realized this was the fourth time I can recall this happening, and their also being a near-miss in 2009. #3… This same situation occurred this July when my partner and his daughter-in-law were visiting the City; Capitol Corridor’s 746 pulled-away from the Richmond station as we were underground transferring. 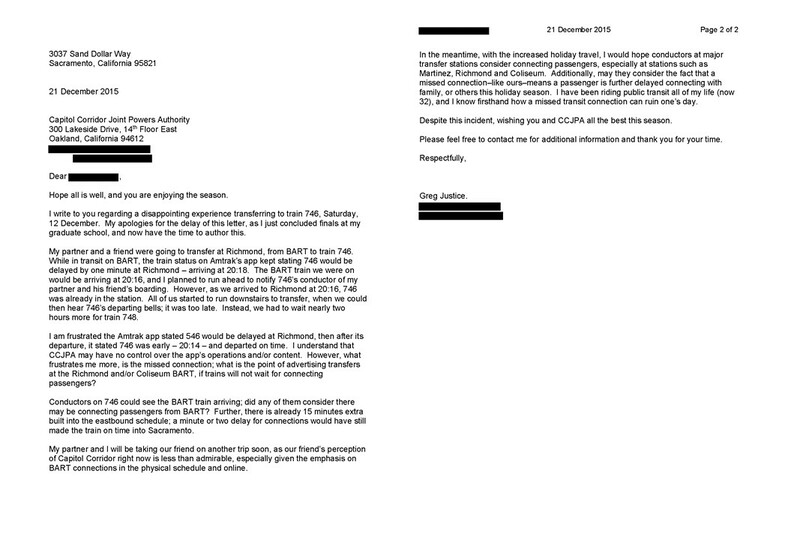 #2… This also happened last December, for which I wrote a letter to Capitol Corridor, and it is pictured below. #1… Further, this also happened Saturday, 19 September 2015. I was in the City that weekend for school, but had flown down to Los Angeles and back that day for my grandmother’s funeral. My partner came from Sacramento to Oakland to take me to dinner. The same incident occurred with Capitol Corridor’s 746. This time, since it was cold, my partner and I made it back to the Jack London Station, and I awaited with him until the last train came. My near miss was in November 2009. The same situation almost happened, but I made it to the train doors as they were shutting. The train did not move–as I was obstructing the doors, because I had seen a fellow U.C. Davis student running up the stairs to catch the train; fortunately, she made it. I cannot remember what the conductor’s response to me was, but being it was around Thanksgiving, I was not about to see a colleague miss the train. Now, first, I know someone can easily counter by saying both Amtrak and Capitol Corridor’s literature explicitly state to arrive at the station 15-30 minutes early. I will give you this. HOWEVER, and this is a big qualifier, when making connections like this, it can be hard to get to a connecting station with such ample waiting time. Further, BART being a rail service, is subject to other service impediments plaguing Capitol Corridor–trespasser incidents, police activity in a car or train set, and as we saw this summer, vehicle on the track. Simply stated, it can be hard fulfilling that 15-30 minute buffer, given the nature of the service and you not having control of transport, as one may have when driving to a station. What irks me–besides the missed trains, is how this connection is heavily advertised on Capitol Corridor materials, and yet Conductors will not take the time to see if anyone is rushing from BART to make the connecting Capitol Corridor train. (There is one Conductor I know who does wait, but they will remain nameless, given a supervisorial history of punishing Conductors for displaying compassion to passengers.) With its openness and descending connection, the Coliseum station allows Conductors to do just this; see running passengers from afar, thereby, holding the train for any these same passengers jetting to board. The Richmond station is visually impeded by the underground connection, so Conductors cannot see those passengers racing to make the train. Another frustrating aspect to these experiences for me has been that two of them included new riders in my party; my partner and I were taking a friend, and later family member, on their first Capitol Corridor trip, and this is one of the last impressions of their train ride. Even with my lower-back pains and being disabled, I do not mind running. What kills me the most is if seniors and mobility-impaired passengers experience this connection calamity; literally jeopardizing their health and physical wellness to make the Capitol Corridor train, when a Conductor could wait for them, especially if it is the last train of the evening. Richmond is also a windy station, and not known for its neighborhood hospitality; hence, staying another hour or more for the next Capitol Corridor train is not a high priority of mine. In conclusion, my point is simple: why does Capitol Corridor promote BART connections as they do, when Conductors will not even wait for rushing passengers changing platforms, and given Capitol Corridor is actually managed by BART? As always, your thoughts are more than welcome, and Capitol Corridor is provided the chance for response.